Harold Hoffman's bad heart was straining with his every wheeze when he sat down one day in May 1954, wrote a letter to his daughter and scaled it in an envelope that read: "DO NOT OPEN UNTIL MY DEATH." Two decades before, be was the "boy wonder" governor of New Jersey. He had blown into Trenton like a blustery wind, regaling friendly legislators with ribald, ridiculous jokes and busting unfriendly reporters in the snoot. But now, he was a tired, haunted man of 58, with a month left to live, and a terrible secret to reveal. Former Gov. Harold Hoffman was as a thief. He'd been a thief, he said, from the moment of making it big in politics, and plundered the public treasury ever since. By the time of his death his total take was $300,000. "It is a sad heritage I leave to Mother ... and to you," he wrote his daughter, Ada. "But I pray it may be somewhat softened by the knowledge that I do love you all so much." The confession of' Harold Hoffman came as a personal disgrace and a seismic shock to New Jersey politics. But the real stunner was that Hoffman got away with his con game for virtually his whole life. He came from the small town of South Amboy in Middlesex County, where he was a respected member of the Methodist Church, Elks, Rotary, Odd Fellows and Masons. He was a newspaper reporter, bank officer, veteran of World War I. When he came back from the war at age 29, he was elected mayor. A year later, he ran for Congress as a Republican and won. Once he’s started, he won't stop. I should know -- 'cause he’s my Pop! But the election of '26 set the course for Hoffman's descent into corruption. He'd been promised $17,000 in campaign money, and spent it. Then, the man who made him the promise -- U.S. Sen. Hamilton Kean, grandfather of former Gov. Tom Kean -- coughed up only $2,500. Hoffman was deeply in debt, but kept up a free-spending life in Washington -- throwing lavish parties, stocking a bar full of bootleg booze in his apartment, buying friends presents on a whim. To keep himself afloat, he embezzled from the South Amboy Trust Co., where he was president and principal stockholder. Eventually, Hoffman decided to leave Congress and run for what was then the elected, and unglamorous, post of state Commissioner of Motor Vehicles in 1928. It looked like a puzzling comedown in the political world. But having control of a state government bureau gave Hoffman access to bundles of cash. With his newfound source of wealth, Hoffman proceeded to dip into the commission's account with wild abandon. Every month, he would take up to $50,000, covering his tracks with forgeries, phony ledger statements and fund transfers. Even his election as governor in 1934 did not make him more cautious. He kept stealing -- with one final plunge for $35,000 in 1937 -- and looting other accounts to fill the ones he had emptied. A complete audit would have revealed the missing money, but no one paid much attention to the books. After all, Harold Hoffman was a popular guy. As a Republican governor in a normally Democratic state, he was looked on as a potential vice presidential nominee in 1936. And he was one of the busiest after-dinner speakers in America, a jolly fat man (5-foot-7, 210 pounds) with a self-deprecating sense of humor. "He was a masterful storyteller and he had a million jokes he could summon up," said Wesley Lance, who was elected an assemblyman from Flemington in 1937 and often saw the governor at political and social events. "In one story, Hoffman says he's riding on a bus with some fellows on their way to the lunatic asyIum The driver is counting off the inmates -- 1. 2. 3. 4. 5. 6. "Then he comes to Hoffman and asks, 'Who are you?' And Hoffman says, 'I'm the governor of New Jersey. 'And the driver counts him off, too, 7, 8, 9, 10 ..."
Hoffman loved the circus and loved to act the clown. At fund-raisers for the Circus Saints and Sinners, a group that supported retired circus performers, he would delight in dressing up in costumes and spritzing dignitaries with seltzer water. In politics, his clown act did not go over as well. The Hoffman administration was a disaster. He alienated his own party by passing a hugely unpopular sales tax in 1935 and was forced to ally with Jersey City's corrupt Democratic boss Frank Hague. In '36, he meddled disastrously in the Lindbergh baby-kidnapping case. Convinced that Bruno Richard Hauptmann was innocent, Hoffman asked Burlington County's eccentric chief of detectives, Ellis Parker, to seek out the "real" killer. Parker abducted a disbarred Trenton lawyer, Paul Wendel, and beat a confession out of him. The only result was that Hauptmann went to the electric chair and Parker went to prison. Hot?tempered and intolerant of any criticism, Hoffman lashed out -- literally -- at his opponents. Once he decked a reporter whom he outweighed by 90 pounds and knocked him out cold. Another time, he picked a fight with a Trenton journalist and exlightweight boxer, Lou Angelo. Angelo bopped Hoffman in the nose and celebrated his triumph in a self?published pamphlet, "I Socked Hoffman." All these antics spelled political doom for Hoffman. But he acted throughout like a man whose sense of himself was untroubled. "If what he'd done had ever worried him," one anonymous friend later said in a Saturday Evening Post article, "he must have got used to it, like a man can get used to a wearing a wooden leg." Hoffman was passed over by his own party when he tried to run for re-election in 1937. But the GOP, having dumped him from the ticket, installed him as the new director of the state Division of Employment Security. His new job enabled him to complete -- or so he thought -- his work of covering up the thefts from South Amboy Trust. He did it by moving around money that was meant for unemployment compensation or for disability. Then he'd deposit the money at the South Amboy bank after forging the bank vice president's name on the certificate of deposit. Over the course of the ‘40s and early ‘50s, Hoffman juggled around nearly $16 million in state funds to cover up $300,000 in thefts. Of the fund transfers, $2.5 million went into an account -- a non-interest-bearing account at the Trenton Trust Co., the bank beaded by the city's No. 1 booster, Mary Roebling. Roebling and Hoffman had been friends for years, and he was the one who appointed her to the state Unemployment Compensation Commission. Mary Roebling had a reputation as one of the most astute financiers in New Jersey – but she would later say she had no inkling that Hoffman's deposits were anything but on the up?and?up. Hoffman apparently made no direct thefts from the state's unemployment funds. But he had grown used to treating the public treasury as a private account and he encouraged his friends to get rich. Eleven of his aides in the Employment Security Division would later be linked to corruption -- though none was ever charged criminally. Some of them rigged contracts. Others covered up Hoffman's own manipulations. In 1954, however, a Democratic governor took office, Robert Meyner. Meyner was troubled by reports of jobless people getting their unemployment checks late, and so he ordered a complete audit of Hoffman's division. What he discovered shocked him. There was $300,000 unaccounted for, and Hoffman was unable to explain it. Meyner suspended him on March 18 but kept quiet as to the reason why. The governor was apparently hoping Hoffman would just bow out gracefully. But Hoffman was a dying man. In May, he carefully penned his testament to his daughter. On June 3, he trudged into his Manhattan apartment, one that the Circus Saints and Sinners had given him rent?free. As he bent down to untie his shoelaces, he fell dead of a heart attack. From there, the letter went on to tell the broad outline, but not the details, of how he stole $300,000. He excused himself by claiming he would have paid it all back but for “a certain state official, unnamed but dead,” who blackmailed him for $150,000. The letter did not name the blackmailer, and that person’s identity – or whether that person even existed – remains a secret of New Jersey history. The Hoffman letter exposed an incredible web of deception that took a year to untangle. Eventually, a phone tip to state investigators led them to a warehouse on Fowler Street, which yielded Hoffman’s ledger spelling out all the accounts he’d raided. The case of Harold Hoffman led to tighter controls in New Jersey’s state accounting system that are still in place today. But did it make politics any more honest? Let Harold Hoffman, speaking from beyond the grave, have the last word on that one. Democratic Gov. 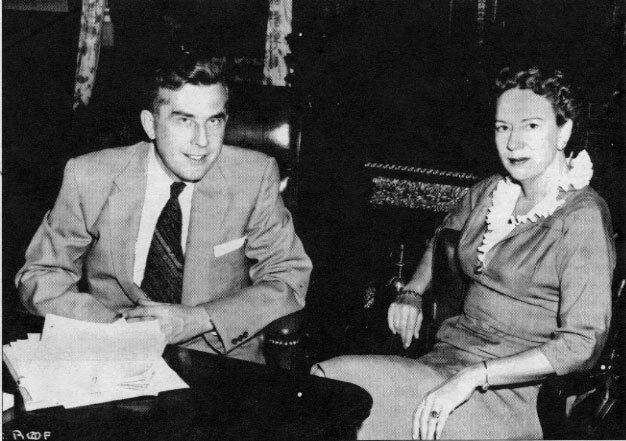 Robert Meyner discovered Hoffman's damage, while banker Mary Roebling said she had no idea the GOP pol was using her institution to sock away his thefts.